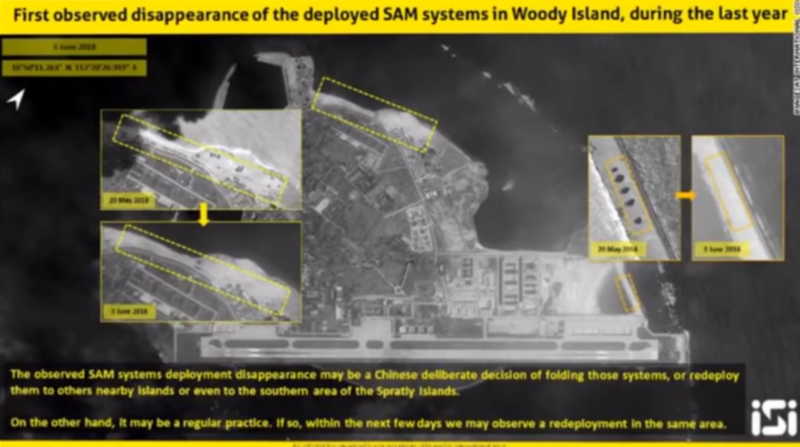 New satellite images recently released by the Israeli intelligence firm ImageSat International (ISI) suggest that Chinese surface-to-air missile systems previously stationed on a contested South China Sea island have either been removed or relocated. Woody Island, the largest island in the disputed Paracel Islands chain, hosts several Chinese military installations, including systems for defending the island from sea and aerial attack. But now it seems that some of them have gone missing. Analysts, as they typically do, have their own theories regarding the disappearing act. According to Beijing-based naval expert Li Jie, the systems might have been temporarily removed in order to undergo maintenance work. "Because of the humid weather, plus a recent typhoon in the region, it is likely that those systems needed to be temporarily removed for repair or to have some of the parts replaced," Li told the South China Morning Post. How long they'll be gone depends on what kind of servicing they need. "[A redeployment] would happen much faster if it's just to change some small parts, but if the whole system needs to be replaced, then it would take much longer because it needed to be shipped back to places like Hainan for replacement," he added. Two unidentified US defense officials told CNN it was very unlikely Beijing opted to completely remove the missile system, and suggested instead it's just hidden inside buildings on the island. ISI suggested the disappearance might just be part of a routine practice of moving missiles and that they've been redeployed to another island in the region. "On the other hand, it may be a regular practice," ISI said in a statement to the outlet. "If so, within the next few days we many observe a redeployment in the same area." Photos show disappearance of China's missile systems on Woody Island. However, according to Ni Lexiong, a naval expert with Shanghai University of Political Science and Law, the removal has more to do with China trying to take a step back and let the boiling tensions in the region, with the US in particular, settle somewhat. "With the increasingly tense relations between the two countries, it's understandable that we make a little gesture of compromise," Ni told the Post. "It's not wise for China to directly confront the US. We shall decide later [on possible redeployment] after the tensions go down." "It's better that we make three steps forward and two steps back, because both sides are still restrained and neither side wants to go to war," Ni added. The photos, which were snapped on June 3 by ISI, were released days after two US B-52 bombers flew above disputed islets in the South China Sea on Tuesday. Chinese Foreign Ministry spokesperson Hua Chunying condemned the flyby Wednesday, calling it a US military attempt at "hyping up militarization and stirring up trouble."